Two Relaxsak premium Monster Saks for the price of one – only $625. Oh yeah, and shipping is on us! This special is available only in select cover options. If you opt for the unmatched comfort and durability of our microvelvet covers, the price will be $40 more. The XL Relaxsak 5 is a perfect fit. If you’re looking for something super soft to recline on and can’t handle the spacious size 6 or 8 bags, this is your best option. 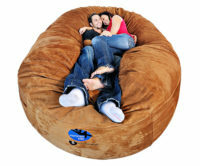 No worries though- it’s still plenty big for 2 people to cuddle on. Best of all, prices are just as comfortable as the sac. 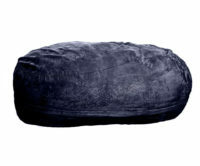 The size 5 premium fill Monster Sak is the preferred sak for gamers, youngsters, or those who like to relax. 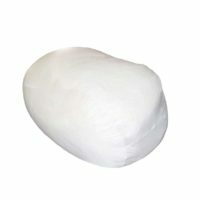 Our premium fill bags are even more plush because we mix our foam with pillow-soft cotton. Designed to last with their double stitched seams, industrial zippers, and microsuede/microvelvet fabrics. Size: Approximately 58 x 42 x 30 inches oval; 60 x 60 x 38 inches round. Measured at widest points. Variations occur based on how the sak is fluffed and sat on.